March is here, the Olympics are over and the winter “pause” is over. That means the TV schedule gets back to normal and some new premieres. Don’t miss the Ultimate Guide to the 2010 Winter TV Season Premieres with free downloads by premiere date & by show name. Winter Olympics: Closing Ceremonies (7pm on NBC – Available in HD) The games conclude with the men's hockey and men's cross country skiing finals (noon NBC) and the closing ceremonies (7 p.m. NBC). Masterpiece Classic: The 39 Steps (10pm on PBS – Available in HD) – A new adaptation of the Alfred Hitchcock espionage thriller classic. The Marriage Ref (10:30 on NBC) – A new realityTV/Comedy show – this one is has been pushed by NBC all throughout the Olympics with lots of facetime for Jerry Seinfeld since it’s his show. The Marriage Ref features a different set of celebrities taking sides in marital arguments each week with Jerry Seinfeld, Kelly Ripa and Alec Baldwin as “panelists.” Moves to it’s regular time slot on Thursday, March 4th. The Tonight Show With Jay Leno (10:35pm on NBC – Available in HD) – Leno returns to late-night. Southland (10pm on TNT – Available in HD) – Were you a fan of NBC’s police drama, Southland? You know, the one that NBC cancelled last season? Well TNT has picked the show up with all new episodes for your viewing pleasure. 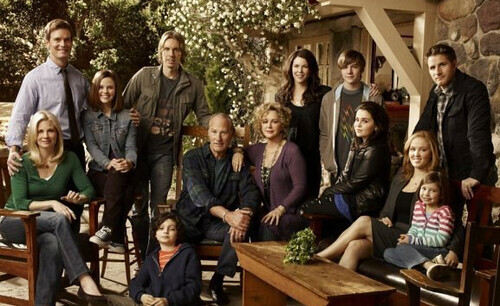 Parenthood (9pm on NBC – Available in HD) – An all-star cast for this new sitcom. On my list of possible good ones although it will be a very tall order to beat out or even come close to the greatness of Modern Family in my opinion. Parenthood stars: Peter Krause, Dax Shpard, Craig T Nelson, Lauren Graham among others. Produced by Ron Howard which makes me set it up as a record on my HTPC. Players (9:30pm on SPIKE) – New series on Spike… Executive Producer Matt Walsh stars in Players about a happy-go-lucky guy who owns a bar with his conservative brother. Web Soup (7pm Wednesday on G4 (second-season premiere).